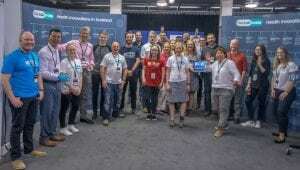 Read Dr Tammy Watchorn, Head of Innovation at National Services Scotland blogs about the Co-Lab (orate) showcase that was held at TEDxYouth & TEDxGlasgow a couple of weeks ago. 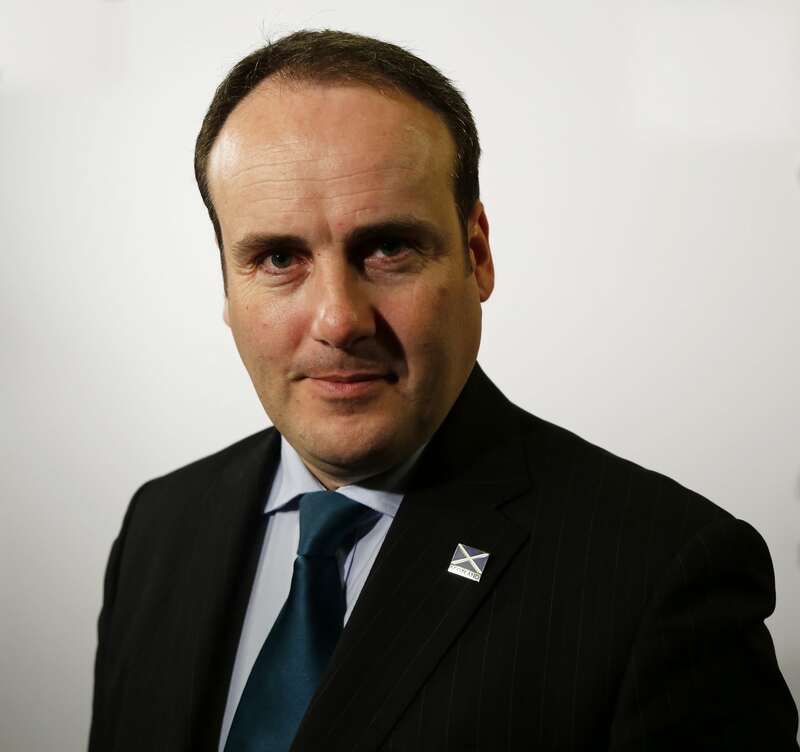 Paul Wheelhouse blogs on Scotland’s innovation success story. The Scotland we know and love has been to a great extent forged on innovation: it’s intrinsic to our culture. Many of the advances that shaped the modern world were discovered or invented by Scots. Today, Scotland’s businesses and our universities remain at the cutting edge of research and development – in key sectors like energy, life sciences and digital technology – in areas such as computer games, Fintech, or digital health. In modern Scotland, innovation in products, processes and service delivery drives improved productivity, competitiveness and growth. It also is essential to the resilience of local businesses and, through them, local economies. We also know that innovation can, through boosting productivity, also lead to improved earnings for the workforce and this can contribute to improving sustainable, inclusive economic growth. 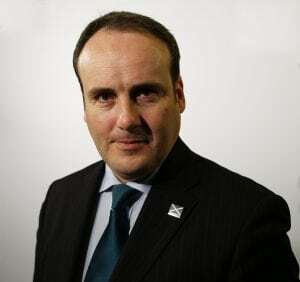 For our part, the Scottish Government wants to build on Scotland’s rich history of innovation by supporting the talent and potential of Scotland’s entrepreneurs, our inventors and our businesses as well as public and third sector organisations. Our vision is for a Scotland where innovation is an intrinsic part of our culture, our society and our economy. We want every business or organisation, no matter how big or how small, to think about how it can innovate and get ahead, and stay ahead, of its competitors or to satisfy its customers. Our long term ambition is to boost Scotland’s innovation performance to match the levels of the best performing countries in the OECD. We are seeing great progress already, with record levels of Business and Enterprise Research and Development spending in 2016, at just under £1.1bn, but we want to grow this to £1.75bn per annum by 2025. To help achieve this, we have raised R&D spending by our enterprise companies by 70% to a total of £111m over this and the next two years. To help raise awareness of the benefits of innovation to businesses and celebrate existing successes, the Scottish Government sponsors a range of innovation focused events. Part of this includes TEDxYouth & TEDxGlasgow where we have been working in partnership with a range of stakeholders including the NHS, Datalab and Digital Health Institute to showcase a range of innovative solutions to our health care needs. Some of the innovators that showcased at the recent TEDXGlasgow event have blogged on their innovation success story. I hope it inspires you to think about what you can do to rise to the challenge and innovate in your own organisation. Project X is a corporate systems accelerator that helps entire industries to adopt more profitable, sustainable innovations in their supply chains. We have a decade before catastrophic climate change, habitat loss, and mass eradication of species becomes irreversible. The aim of Project X is to radically transform the sustainability performance of 10 selected industries in 10 years – those most responsible for biodiversity decline and climate change impacts, to enable a more positive relationship between people and planet – and deliver a shift of circa 3% of the total global GDP to sustainable procurement. Our name comes from this link to Roman numeral 10, and that we are the nexus – a non-judgmental connection between key stakeholders in each industry; the innovators, the companies and the investors – working to sustainably support their interests so that real progress can be made. We know that the investment community are looking for one thing above all – profitable investments. We believe the key way to achieve this at an accelerated pace is through self-interest and relationships. That is why we manage a free-to-enter investment community called Project X 100, where we invite key investors to join us on the journey and build trust in the investment potential opportunities, over time. The Project X methodology has two phases: De-risking the adoption of a small number of sustainable solutions into a corporate value chain to prove that they can meet industry challenges. The second focuses on incrementally scaling up these innovations, first through a single company’s operations and then into multiple corporations to reach the 10% of global industry target. One of the key things that makes us unique is that we’re shifting the focus from the innovator ‘push’ to market ‘pull, at an industry level. At scale, self-interest is a powerful driver of action and by focusing on market pull rather than the innovation push we’re helping whole industries to accelerate the adoption of sustainable innovations at scale. What really excites us is the opportunity to demonstrate real tangible results on the ground for an industry that has been challenged to drive cutting edge sustainable innovations into the heart of their operations and at scale. We are also excited about the ‘10 industries in 10 years’ report that we are launching with WWF in Quarter 4 of this year. This report will give us a chance to identify specific industry players which are beginning to show leadership on this transformation. And leadership leads to long-term, sustainable value. Lucinda Bruce-Gardyne, Founder of Genius Food blogs on turning a personal family problem into an innovative solution which has helped people with food intolerance lead healthy day to day lives. In 2007, my three year old son was diagnosed as being gluten intolerant which made our everyday lives very difficult . It was a challenge to make him a packed lunch or even take him for a picnic as there were few fresh healthy alternatives to bread available. As a mother, I was determined to solve this problem for my family and turned my passion for cooking towards finding an innovative solution. This led me on an exciting path of discovery, and over the next three years I worked tirelessly, undertaking a lot of research and development to develop a soft, fresh and tasty gluten-free bread. I knew my family couldn’t be the only ones facing this problem and founded Genius Foods in 2008, launching my product nationally the following year. We now export our products across the globe to Europe, Australia & North America. I am delighted our range of 25 products has helped make a difference to people that are dairy or gluten intolerant. We have made products that are hard to make at home available and convenient helping those with intolerances live everyday lives. Talking to consumers about our products makes everything worthwhile. We are in tune with their needs and have adapted our product range to suit their everyday lives. We constantly engage with them, as with the nature of innovation, their needs and wants change and we need to continually stay in tune with their requirements. Launching Genius Foods has opened many doors for me. For example, I was elected as Fellow of the Royal Society of Edinburgh in 2017 and now sit on the Enterprise Fellowship Panel. I have found this role fascinating, and am particularly enthused about entrepreneurs’ innovative proposals, which can help the Scottish economy grow whilst they take their products or services to the next level globally. A key aspect to our success is that through blood, sweat and tears we worked through our challenges and became stronger by doing so. We have made mistakes but we have learned from them and in doing so have made our business resilient. I have built a fantastic, supportive team who have been with me every step of the way; I can’t thank them enough. Our mission doesn’t stop here, I want to make sure that gluten-free products are mainstreamed and are readily available both when eating at home or eating out. Come along to TEDxGlasgow to hear me talk more about my winning recipe for innovation. Nick Earle, SVP of Global Field Operations, Virgin Hyperloop One blogs about how they are helping to collapse the Barriers of Distance and Time with Hyperloop. On average, I’ll spend about four years of my life travelling when accounting for all the time I spend moving around. Business travel, running errands, commuting, driving to see mum all adds up. A trip from London to Glasgow by train, for example, takes five hours. Imagine what it would be like to make that same journey in 50 minutes? Hyperloop is two to three times faster than high-speed rail and could make this possible. The company I work for, Virgin Hyperloop One, are working on the technology to prove that hyperloop, the first new mode of public transport in 100 years, isn’t just imaginary. This is how hyperloop works. You start with a pod in a tube and remove most of the air. This eliminates aerodynamic drag and weather hazards. Then the pod is propelled using a proprietary linear electric motor which accelerates the pod safely and gradually to airline speeds. Once the pod gets going, it lifts off the track using magnetic levitation. It glides in a near vacuum for many kilometers with no additional energy, noise or friction. Speed isn’t the only way hyperloop is different. A traditional train follows a schedule and typically has multiple stops. Hyperloop is on-demand and direct. It leaves when I am ready to go with no stops along the way. The system is also 100% electric with no direct emissions. This can radically impact business, enabling people and goods to travel faster, farther with less energy. Virgin Hyperloop One was founded in a Los Angeles garage four years ago. Now we’re 300 of the engineering, transportation, and technology’s brightest minds. We were the first to build and test a full-systems, full-scale hyperloop. In December 2017, we reached historic speeds of 387 kilometers per hour on a 500-meter track. This video tells you more about it. The goal is for this innovation to be part of your daily lives with operational systems in years not decades. We’re in continuing discussions with governments to study ideal routes and progress the first projects. This year, we’ve already seen ground-breaking commitments in India, UAE, KSA and the U.S.
Hyperloop can leapfrog their economies and deliver unprecedented connectivity and opportunity to their citizens. With hyperloop, we envision intercity travel as just as accessible as intra-city. Come along to TEDxGlasgow to hear more about this innovative advance in the future of travel. I have lived with diabetes for 15 years and continue to struggle to self-manage my diabetes. It requires constant effort and is something you can never take a break from. As technology has transformed the world, diabetes technology has not evolved as quickly. Newer technologies have become available but can cost thousands of pounds per year meaning that most people continue to use finger prick testing to check their blood glucose levels and injections to administer insulin. PenPal is a low-cost device that will turn existing insulin pens into a smart device. It is a replacement pen cap that conveniently attaches to existing insulin pens. It helps insulin pen users administer timely and accurate insulin doses. PenPal provides reminders, tracks usage and connects to our app, allowing the user to share their data with their family, friends or healthcare team. In Scotland, 291,981 people live with diabetes, one of the highest rates of incidence in the world (5.4% of population). As a chronic and lifelong condition, diabetes represents a significant challenge, with serious health implications if not managed appropriately. Due to the nature and pathology of the disease, healthcare professionals can usually only directly assist their patients by treating acute morbidities and providing guidance and advice for how to minimise adverse effects. We plan to develop early warning systems which can help identify people not administering insulin injections and reduce hospitalisations. More data can help tailor insulin requirements to improve blood glucose control. This may reduce medication usage and complications associated with diabetes. Providing a platform to share data with the healthcare team can facilitate remote monitoring and potentially reduce the need for outpatient appointments. Rachel Bowman from Snap40 has blogged about how they are helping to monitor patients 24/7 through their wearable technology. Snap40’s mission is to protect the health of every human being, globally. We believe in making the working lives of doctors and nurses easier. We believe in challenging the healthcare status quo and building tomorrow’s technology to save lives and flip the healthcare model. Healthcare should come to us, automatically, before we know we need it. Snap40 was founded in 2015 in Edinburgh by Christopher McCann and Stewart Whiting. Whilst a medical student at Dundee University, Christopher witnessed how the decline in patients’ health was often a result of the signs of health deterioration not being picked up sooner. He conceptualised a product that would automatically identify patients that were in need of medical attention, long before they became sick. After partnering with Stewart, who has a PhD in computer science and wealth of experience gained from working at Microsoft, snap40 was born. Snap40’s simple wireless wearable device is worn by patients in either the hospital or in their home. The device’s sensors detect physiological data (known as vital signs) from the patient continuously and automatically without any input from the patient or healthcare professional. Our secure software platform then continuously monitors vital sign trends and generates an alert when a patient’s vital signs deviate from the norm. Alerts are received by a doctor or nurse who can then provide medical intervention. By detecting deterioration sooner lives can be saved, and patients can go home sooner having had a better healthcare experience. It also means nurses are freed up from taking manual vital sign observations and inputting data, allowing them to concentrate on delivering care which is particularly pertinent in a time of stretched resources. Patients who have just left hospital or suffering from a long-term condition can also be monitored using our device in the comfort of their own home. If their health declines, care can be delivered in the home resulting in reduced readmissions to hospital. We are already working with numerous healthcare providers in USA and UK and patients tell us they feel more secure, independent and safer wearing our armband. snap40 are growing at a phenomenal pace as we relentlessly strive to enhance the healthcare experience globally. Barry Leaper, co-founder of LiberEat, blogs on how their app is helping people with dietary restrictions to eat and live normally. 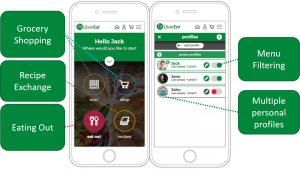 LiberEat has developed an app to make life easier for people with dietary restrictions. It shows users exactly what they and their family members can have when grocery shopping, eating out, and searching for recipes to cook at home: families can save time and energy yet have the confidence to explore more within their diet. We came up with the idea to develop the LiberEat app because of personal experiences: Barry, a co-founder of LiberEat, struggles to try new restaurants as his wife has dietary restrictions and his mother has coeliac disease: co-founder Louise was told by her doctor she needed to avoid certain ingredients and found finding suitable foods stressful and time-consuming (it’s easy to go word blind when scouring through page after page of ingredients lists, cross examining every detail). They had all looked for an app that could take the stress and inconvenience out of these situations but found that there wasn’t one that ticked all their boxes. Barry and Louise decided to develop the LiberEat app to help as many people with dietary restrictions as possible. Initially the focus will be on the major allergens and other commonly avoided ingredients, however this will be expanded on to offer support for evidenced based health eating, certain medical conditions, and other categories. 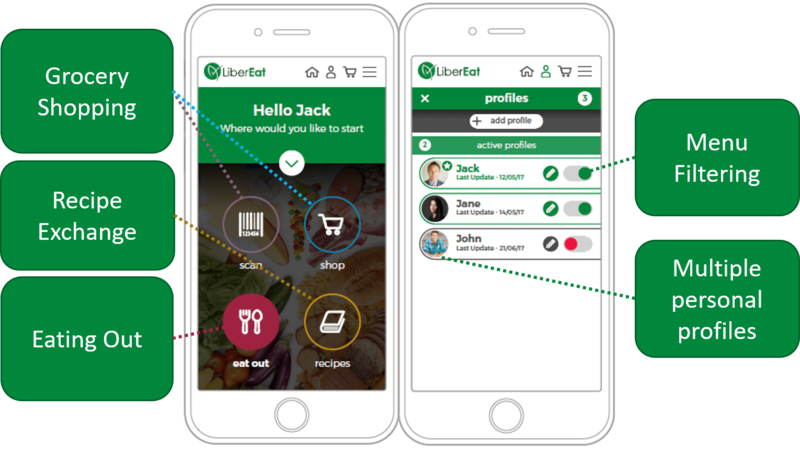 Already LiberEat has traction with major retailers and restaurant chains so that users will benefit greatly from a variety of choice, convenience, and information. The Anaphylaxis campaign is also working with LiberEat and helping with the launch of the app. The app is targeted to be released in late June and an NHS patient trial is planned with a focus on how the app can improve family life where children have dietary restrictions. LiberEat benefits from guidance and expertise from academics at Robert Gordon University, The University of Aberdeen Rowett Institute and the University of Glasgow, who all recognise the potential of the app to improve patient outcomes by making it much easier for people to stick to recommended dietary plans and maintain some normality in their routines. Anonymised data collected can be used for healthcare and research purposes by healthcare providers and academics and we have also been exploring other applications in the healthcare sector with the support of SHIL. We believe that LiberEat can make a real difference to people with dietary restrictions and improve patient outcomes. Mark Abbs, Chief Executive Officer of OrganLike, a team of leading bio-engineers, technology innovators and surgical practitioners, blogs on the impact they are having on healthcare. Our new innovation business, Organlike, founded by Prof Will Shu and Dr Isaac Wang(Strathclyde and Herriot Watt Universities), is revolutionizing the 3D printing of life-like soft materials. Our novel technology quickly prints 3D models from organic material which are highly realistic and low-cost. Collaborating with surgical teams in NHS Highland is enabling us to refine our market entry product(s) and these will be evaluated by leading surgeons for vascular surgical training (Autumn 2018). We are taking research to the forefront of cutting edge applied science, developing suitable models for market, taking advantage of 3D printing as it becomes ubiquitous in many areas of society. Routinely using 3D printed plastic models, a Chinese surgical team has published (July 2017) a two year study showing that routine practice before treatment of spinal tumours has reduced theatre operating time by 30%, and has reduced patient recovery time by 33% (as a result of reduced soft tissue damage and bleeding), total procedural costs were reduced by 25%. A number of new business and established large corporates have sought to commercialise and improve this capability producing valuable models made of hard silicon, rubber or hydrogels. These are an improvement on plastic but are expensive (£1.5k upward), take several days to produce and still lack the look, feel and dynamic response of real organs. Our unique product takes this breakthrough further, we have the ability to produce many different exact facsimiles of diseased organs, quickly and cheaply. We can do this at low cost, in short time frames, from CT and MRI scans, reproducing exact and real situations or replicating hypothetical condition. This offers an exciting breakthrough for surgical training.